Years of horse riding and handling expertise combined with years of experience in importing and logistics has combined to create "Portable Horse Stables". 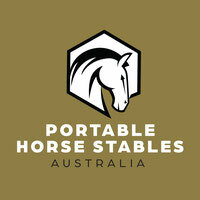 We are a company based in Tamworth, NSW which is fast becoming one of the most well known equine locations in Australia. Our product is perfect for horse owners leasing property, or clubs and veterinarians needing extra stables at an affordable price. Portable Horse Stables are suitable for all horse sizes and breeds. Designed by experts within the equine industry, Portable Horse Stables have a high quality HDPE infill making them durable, UV and bacteria resistant. These portable horse stables are a semi-permanent, safe and quality solution for the budget conscious equine owner and trainer, or those needing to keep an injured horse or foaling mare close and accessible. They even double as a way to erect stables within an existing shed or shelter. Split 180 degrees swing gate with simple, safe and effective latches including bottom pin to stop gate flex. Four durable panels which are flat-packed for effective transport and easy storage. Ability to join two or more stables together. Integrate a day yard using separate horse or cattle panels.